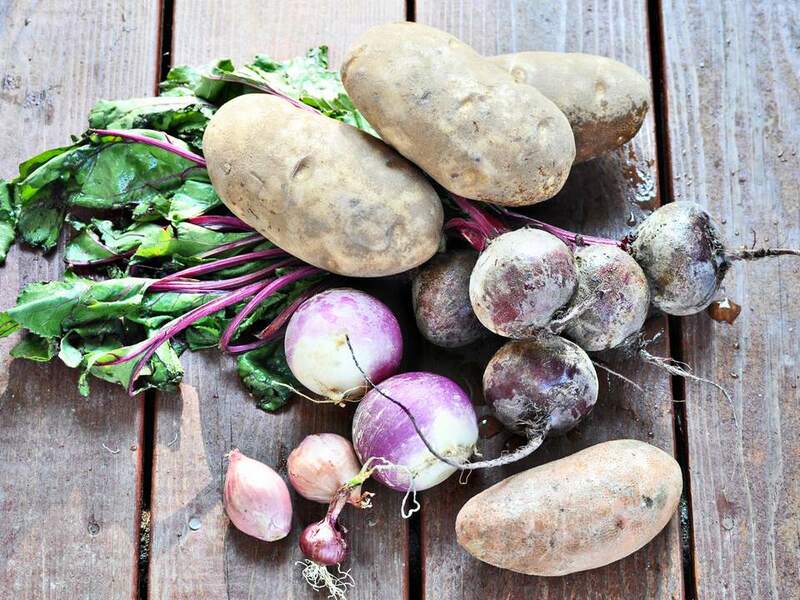 Root vegetables are one of the great mysteries of gardening. You plant a seed and wait, hoping the roots develop well, while hidden away from sight. Once you pull them up, it's too late to avert problems. Which means it's very important to start them off right and give them good growing conditions. Root vegetables all need room to fill out, especially the longer root vegetables like carrots and parsnips. Loose soil is absolutely crucial. Roots that have to fight their way through heavy, compacted or rocky soil will never fully develop. When their roots hit a rock, even a relatively small one, it will bend or fork and you will wind up with deformed vegetables. They'll still taste good, but they will probably be smaller or thinner than they would be in loose soil. If you know your garden soil is not up to the task, consider growing your root vegetables in a raised bed filled with better soil. It will make all the difference and once you go through the initial effort of making it, you can devote it to root crops every year. Most root vegetables, like beets and carrots will require some thinning for optimal spacing. Others, like onions and garlic, can be spaced at planting time. Don't be tempted to squeeze in more than you realistically have room for. You may get more bulbs, but they'll be smaller. This is even more of a problem if you save garlic to replant next year. You want to save the largest cloves possible and you won't have much choice if you don't give the bulbs room to expand. This may sound counter intuitive, but root vegetables don't need a lot of nitrogen. Potassium and phosphorous are the major requirements for them. While they do need some organic matter in the soil, to improve the texture and water retention, it's better to add it a month or even a season before planting and keep the fresh stuff for amending the greens bed. When starting seed, moisten it before sowing and keep it moist until the seeds germinate. Plant the seed at the right depth and firm it down gently, rather than packing it down hard and compacting it. Mulching with grass clippings will help to get keep the surface soil moist. Just cover the area lightly, with less than 1/4 inch of clippings. Some root vegetables, like radishes and beets, need to grow quickly, but most need to send out a good amount of leafy top growth before their roots start to elongate and plump up. So even though the part of the plant you are interested in is underground, in the dark, it still needs a spot in full sun to grow healthy and sweeten up. Most of us know plants need 1 inch of water per week, but make sure the water is getting deep down, where the roots are growing. Dig down in the nearby soil and check to see that the water is sinking in and not running off, then make adjustments as necessary. On the flip side, root vegetables will simply rot in chronically wet soil. Watch the leaves for signs of discontent. If they are lush and green, the plants are probably getting the right amount of water. If they have singed edges or are dropping off, there could be a water problem. Although they need sun and many take their sweet time maturing, most root crops prefer cooler temperatures. They often grow better if planted in the cooling days of fall, rather than the warming weather of spring. We don't have a lot of control over the temperature, but we can mulch the area. Mulch will shade the soil as well as helping it to retain water, keeping the soil several degrees cooler than the air temperature. Just be sure your root vegetables are not sitting it soggy soil, or they will rot. Some plants can peacefully coexist in the garden, but they are all competing for nutrients and water. This is not as big a concern when you are growing plants for their leaves or even their flowers. But when you want the roots of your root crops to grow large, control weeds and keep the competition away.